One of the surprises out of today’s Galaxy S4 festivities had to be the amount of accessories that Samsung announced. They are fully entering the health movement, wireless charging (which we got a couple of different answers about), and Bluetooth gaming controllers. We spent a quick minute with the Bluetooth controller, which well, is just a Bluetooth controller. 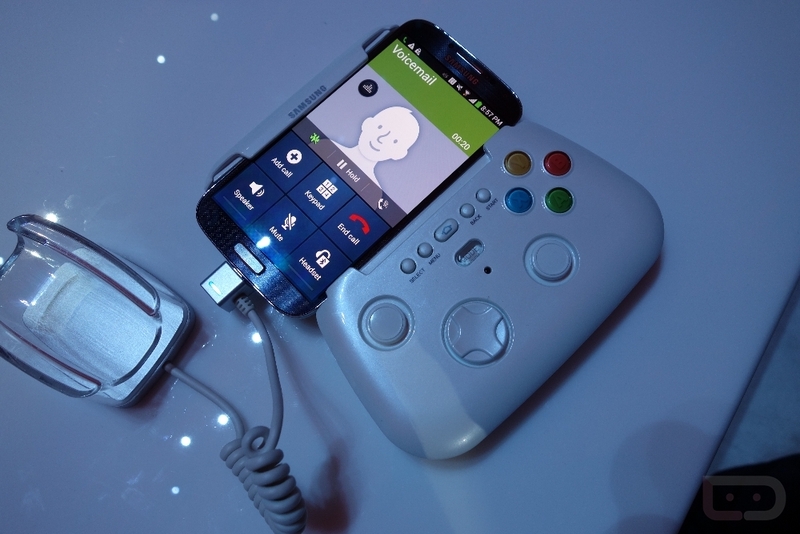 It pairs to the device via Bluetooth, which then allows you to play your favorite games. The build quality is on par with any other controller in the market, it expands enough to hold a Galaxy Note 2, and should be a welcomed addition to the ever-expanding Galaxy accessory lineup. Unfortunately, it may only work with games purchased from the Samsung app store. TechCrunch is also reporting that it isn’t backwards compatible with the Galaxy S3 or other Samsung phones. We weren’t told a price or availability.